Have you been assigned the duty to make arrangements for office thanksgiving party? Remember it’s not just a responsibility but it is a great opportunity for you to get your name written in your boss’s good book. If yes then start making preparations today. Follow the ideas shared below to arrange a corporate thanksgiving party that would impress your boss and make all guests cheer up. Thanksgiving Day is not an office event so all employees will be willing to spend this day with their families or friends especially dinner time then how you will be able to attract people to attend office thanksgiving party? Think about it? Would you like to attend an office thanksgiving party when your family is waiting for you? Your answer will be absolutely No. Then expect same answer from others too. A best suggestion for you is to arrange office thanksgiving party for two to three hours but not at dinner time. You may invite your guests in office hall to have fun or book a restaurant hall where all guests will enjoy. Select a party theme and make decorations according to the selected theme. There are lots of options of thanksgiving party themes to select from. You can decorate party venue using flowers, real or autumn leaves, paper designed turkeys, thanksgiving signboards and banners etc. You can use flower basket for table decoration in office thanksgiving party. You may consult you co-staff members for selection of party food. Mostly cooked and liked thanksgiving party food include Grilled Turkey, Pumpkin Pie, Pumpkin Dessert Chocolate Cake, Sausage and Kale’ Shepherd’s Pie. You may go to some restaurant and taste all these dishes before you place order. Make sure you have exact idea of number of party guests so that no food is left over. Don’t forget to arrange snacks and drinks of different types for thanksgiving party as drinks is the key symbol of office celebrations. 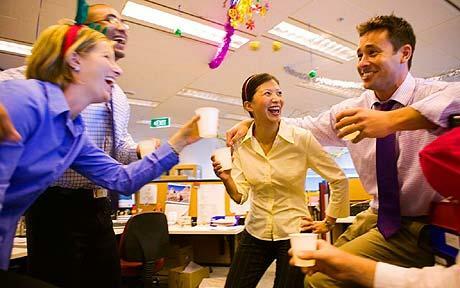 No party is complete without entertainment and games so make a list of games to be enjoyed in office thanksgiving party. It would sound decent to start corporate thanksgiving party with some prayer then introduction and then all time fun and eating. Once the party is started, there is no need to maintain discipline so let all enjoy. It would be great to arrange some music CDs and reserve an area to be used as dance floor. Invite all guests there to dance and play games. We have discussed 10 thanksgiving party game ideas in another post in detail. You can read there. These were some tips that will help you plan a great corporate thanksgiving party.